Syracuse University - Dineen Hall - Evans Roofing Company, Inc.Evans Roofing Company, Inc.
General Contractor: Hueber-Breur Construction Company, Inc.
Syracuse University commonly referred to as Syracuse or SU, is a private research university located in Syracuse, New York. The institution's roots can be traced to the Genesee Wesleyan Seminary, founded by the Methodist Episcopal Church in Lima, New York, in 1831. Following several years of debate over relocating the college to Syracuse, the university was established in 1870, independent of the college. Since 1920, the university has identified itself as nonsectarian, although it maintains a relationship with The United Methodist Church. This University is ranked #58 in the nation with 15,097 undergraduates in 2014. After a decade in planning, Dineen Hall is truly a game changer for the Syracuse University College of Law. After being housed in two separate buildings connected on only two levels, the 200,000-square-foot, five-story, state-of-the-art structure brings the entire College of Law into one inviting space, creating a real community for legal education in the 21st century and beyond. Dineen Hall has transformed the learning experience for College of Law students. Through the intersection of best practices and well-planned spaces for learning and faculty-student interaction, the College of Law is able to provide a superior experience for students to meet the rigorous demands of a modern law degree. Dineen Hall is light, open and modern. Already listed among the 50 most impressive law school buildings in the world, the verdict is clear: the College of Law’s new home is spectacular. The College of Law is in its new home and thus begins a new era of legal education at Syracuse. But Dineen Hall is more than just fancy new bricks and mortar. It is the embodiment of a vision that has transformed the learning experience for College of Law students. Through the intersection of best practices and well-planned spaces for learning and faculty-student interaction, the College of Law is able to provide a superior experience for students to meet the rigorous demands of a modern law degree. Designed and built specifically for legal education, the improved facilities connect space and technology in myriad ways to help students become successful attorneys—everything from deeper desk tops designed to accommodate laptop computers, to broadcasting and video capability, to courtrooms equipped with virtual environment tools that allow students to learn to do things like recreate accident scenes. 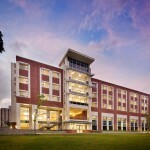 “Dineen Hall reflects the perfect synergy of time, space, and energy that brings SU College of Law into a new century, with a new outlook, the latest technology, expanded faculty, and a promise to further extend our interactive, personal approach to the teaching of law.” says Dean Hannah Arterian. In April 2010, Robert Dineen (Law ’66) gave Dean Hannah Arterian the news that his family was presenting a $15 million naming gift to the College of Law for a new, innovative, state-of-the-art law school. While the generosity of the Dineen family has helped to make this all possible, there have been so many others that have helped along the way. Through the generous support of the Dineen family and our alumni and friends, Syracuse University College of Law was given the opportunity to design a new generation of law school–one that would continue to prepare students with a future-ready legal education and provide the tools they needed to move out into the professional world and practice law. The result: the 200,000 square foot Dineen Hall, a distinctive new five-story, state-of-the-art facility designed to bring everything into a single, elegant, adaptive space. Dineen Hall symbolizes the SU College of Law’s redefinition of legal education. Stressing litigation techniques, client advocacy, and critical writing skills, the College of Law focuses on each individual student’s success. Dineen Hall provides the modern space, tools, and environment to make that a reality. Syracuse University had the vison and now the financial resources so the next step was to select the contractors who would build this spectacular structure. Syracuse University selected architect Gluckman Mayner Architect, located in New York, New York. The General Contractor selected was Hueber-Breur Construction Company, Inc. located in Syracuse, New York. 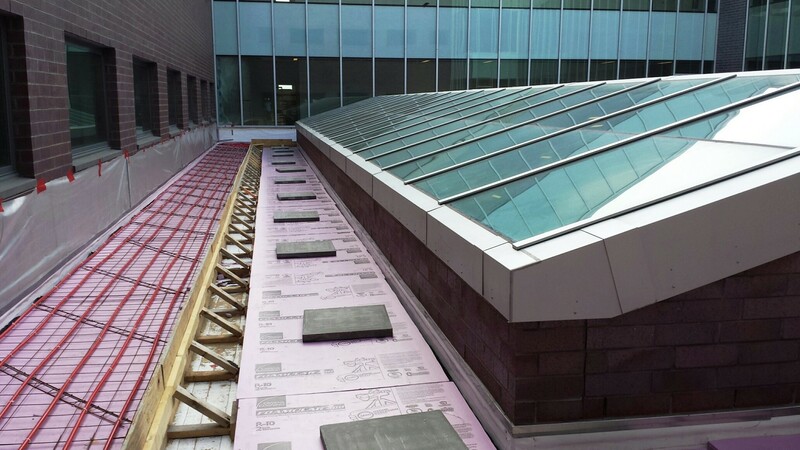 And for the roofer, “CFE, Inc. has had a long standing relationship with Syracuse University performing many projects on campus so when we heard the news we were selected as the roofing company for this project we immediately went to work” said Lenard Ferraro, President of CFE, Inc. 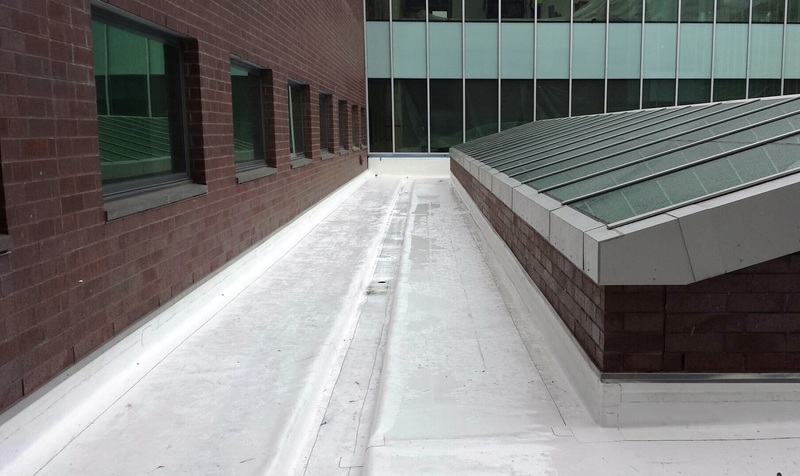 Working with the architect’s design and Sika Sarnafil’s knowledge, materials and products, CFE, Inc. knew that very moment they could exceed their customer’s requirements on this project. 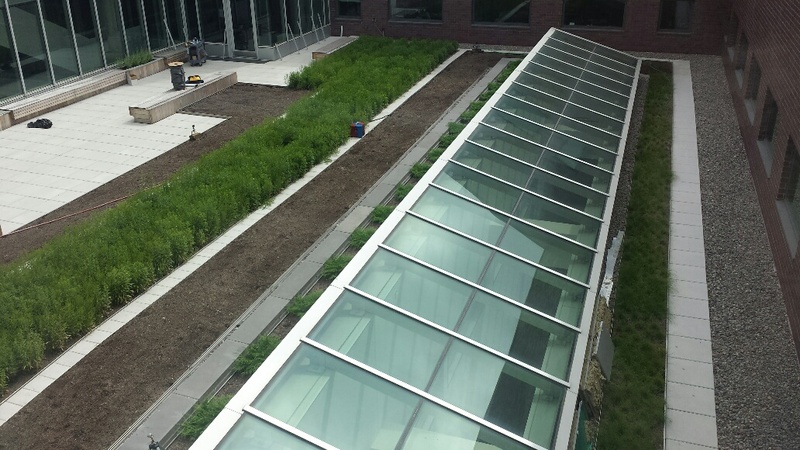 The 3rd floor vegetative roof totaled 5,500 square feet specified Sika Sarnafil consisting of two scopes. Scope A was a loose laid Sika Sarnafil NWP HD leveling layer over sloped concrete deck, loose laid Sika Sarnafil 80mil G410 membrane with heat welded seams and grid strips over leveling layer, loose laid drainage panel over G410 membrane, loose laid two layers of 2” extruded polystyrene insulation over drainage panel, installation of filter fabric, over the insulation, and finally the installation of soil and plantings. 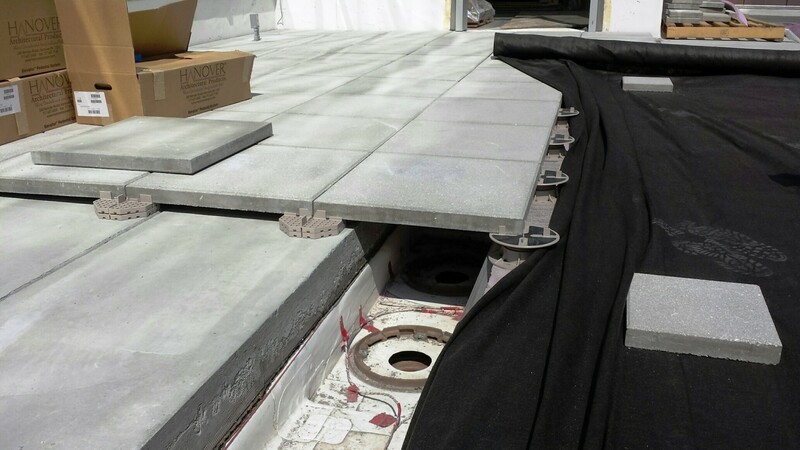 Scope B was a self-adhered SARNAVAP SA vapor barrier over a concrete deck, using SARNACOL 2163 insulation adhesives (flat ¼” per square foot tapered extruded polystyrene insulation over SARNAVAP SA. 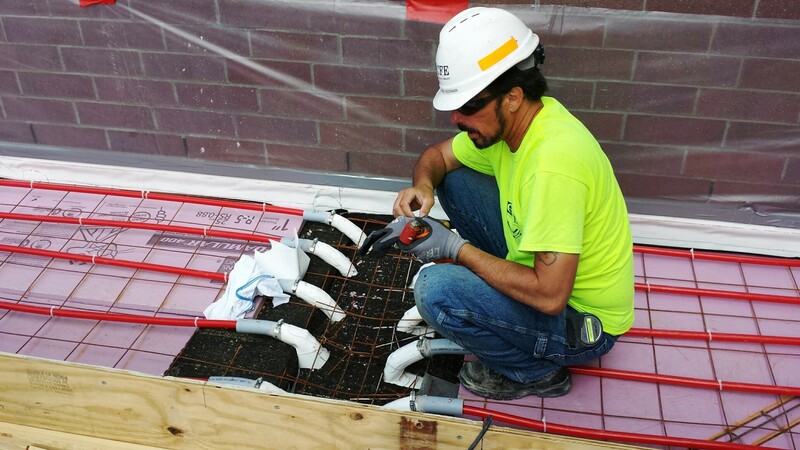 6” minimum at radiant heat slab, ½” minimum at gutter, 3” minimum at flat main areas and 10” minimum at planters), use SARNACOL 2163 insulation adhesive adhering 5/8” Dens Deck of extruded insulation, install EFVM grounding screen over Dens Deck, fully adhered Sika Sarnafil 80mil G410 membrane using SARNACOL 2170 VC adhesive over the EFVM with all seams heat welded, loose laid drainage panels 3811R over G410 membrane, loose laid two layers of 2” extruded polystyrene insulation (40 psi) over drainage panel, installation of filter fabric, and finally the installation of soil and plantings with the additional radiant heat slab installed over filter fabric. This system has a 20-year full system, single source warranty. 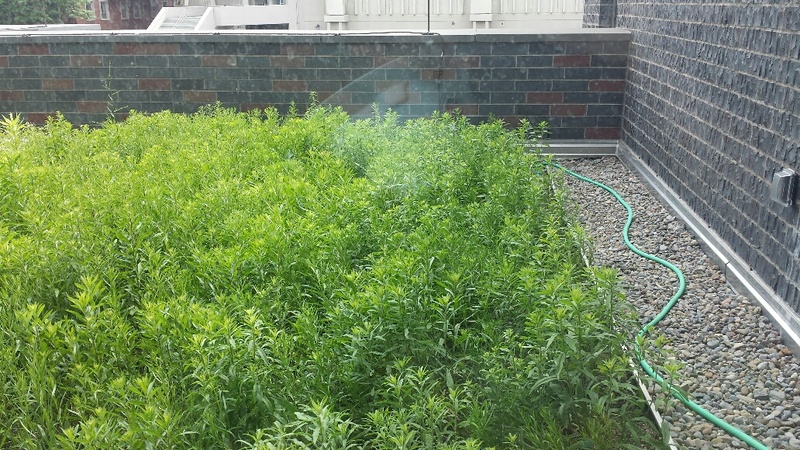 There were two additional vegetative roofs located on the fourth floor totaling 3,400 square feet with the same vegetative components within the system specified above in the 3rd floor roof with a 20-year full system, single source warranty. There are four roof ledges referred to as the “eyebrow roofs” totaled 2,000 square feet with loose laid Sika Sarnafil NWP HD leveling layer over concrete deck, loose laid Sika Sarnafil 80mil G410 membrane with grid strips with heat welded seams over leveling layer, loose laid drainage panel 3811R over G410 membrane, loose laid two layers of 2” extruded polystyrene insulation (40 psi) over drainage panel, installation of loose laid filter fabric with stone ballast. This system has a 20-year warranty. As you can see from the systems specified for installation this was no ordinary project. 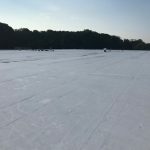 The experienced “CFE, Inc. Field Team” chosen for installation were Luke Edsall, Project Manager; Frank Herman, Site Team Leader and Lenard Ferraro, President who overall kept this job on track, on time and within the financial parameters for the project. Luke Edsall electronically communicated daily with Hueber-Breur Construction Company, Inc., the General Contractor, and once a week in person for trade meetings to ensure our Team was performing within the scope of the project. “Sika Sarnafil assisted us with the needed information to install the system, overburden and warranty for this project. These communications allowed me to ensure our Installation Team performed error-free work each day” said Luke Edsall. Frank Herman, Site Team Leader is a long term associate with CFE, Inc. and a well experienced associate with Sika Sarnafil systems. Frank had approximately 8-10 associates on the project to meet scheduling needs. “I enjoyed meeting the Sika Sarnafil Field Representative when he came out. Not only was he there to inspect our work, he offered some field installation training to my guys. That’s when I knew we had a relationship with Sika Sarnafil – for this guy to spend his time with us was fantastic” said Frank Herman. The Field Installation Team supervised by Frank was approximately 8-10 associates. 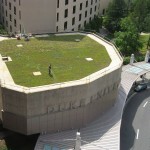 As for LEED™ certification level, Syracuse University has not yet been notified but what we do know is multiple LEED™ credits were earned with the new roof installations. 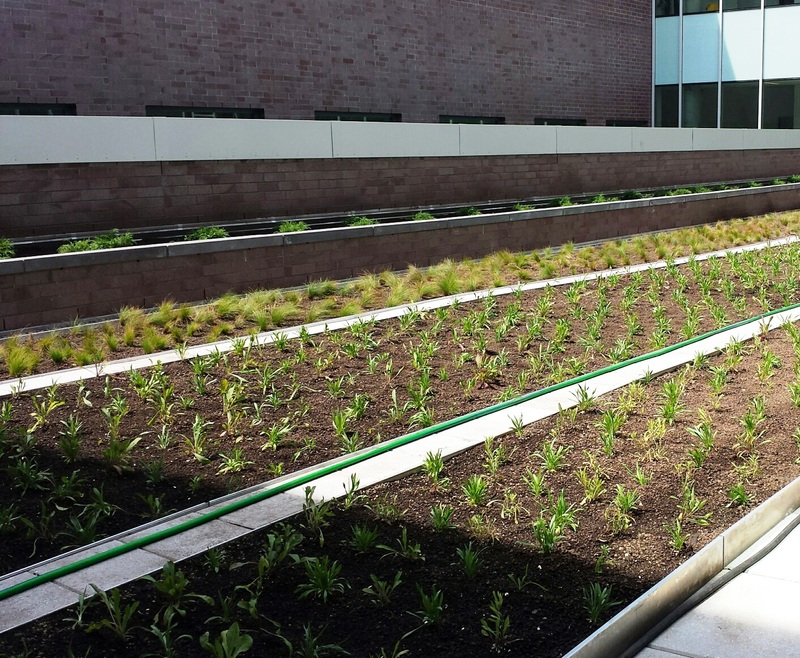 Highly reflective white membrane (SRI), vegetative roofs, storm water retention, recycling efforts and regional materials accounted for many LEED™ certification credits. Some challenges on this project to mention a few were it was fast-tracked (like most all projects today), required production through a New York winter and located directly in the middle of town, which was a logistical nightmare. CFE, Inc. is licensed and registered in 46 states with the ability for our Teams to work in all types of weather conditions. The winter of 2014 was the coldest on record since 1993 with 57 days below freezing! Having the ability to heat-weld Sika Sarnafil membrane was a plus in these temperatures. Logistics, let me tell you this project was smack dab in the middle of Syracuse Hill, a well-known area where parking is non-existent. “Adding a structure like Dineen Hall required a critical though process when loading, unloading and storage” says Bob Pringle, Vice President at Evans Roofing Company, Inc. “We have had a fantastic relationship with Syracuse University for over 45 years, which not only is a credit to our customer’s service and support but a constitutional that relationships still do exist”. Safety was a minute to minute challenge with constant changes to our Fall Protection & Rescue Plans and our daily Job Hazard Analysis’s (JHA’s). Daily safety inspections and JHA’s were performed, weekly “site specific” tool-box talks were performed and weekly safety audits by our corporate EH&S department board certified safety professionals were completed. This project had 9,123 work-hours without a single incident on-site. So in closing, CFE, Inc. once again installed another Sika Sarnafil roof for one of our most valued customers on time, within budget, with no safety incidents, with error-free work and ultimately exceeding our customers’ requirements.